7th April 2019. The Caister Volunteer Lifeboat Service (CVLS) All Weather Lifeboat, the ‘Bernard Matthews II’, accompanied by the Inshore Lifeboat, the ‘Fred Dyble II’, launched for a committal of ashes ceremony. Family members had been invited to watch the proceedings from NCI Caister’s watch station above the CVLS Heritage Centre. 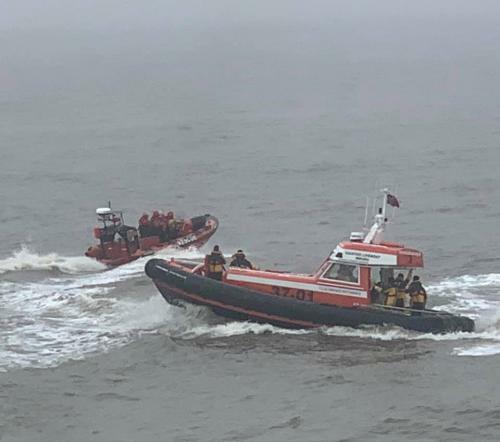 As the All Weather Boat came to rest some 100 metres offshore, a member of the crew conducted a moving ceremony and scattered the loved ones ashes at sea. The ceremony was relayed directly via VHF radio to the watchroom to be heard by the family members. The families thanked NCI for their hospitality and remarked what an excellent job the NCI does.